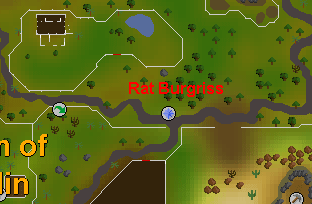 Talk to Rat Burgiss at the crossroads just northwest of the Al Kharid mine, south of Varrock. To start, travel to the crossroads south of Varrock, also just north of the Al Kharid mine, and talk with Rat Burgiss. You find out that Rat is a traveling trader who was recently robbed by some outlaws who stole some important papers from him. 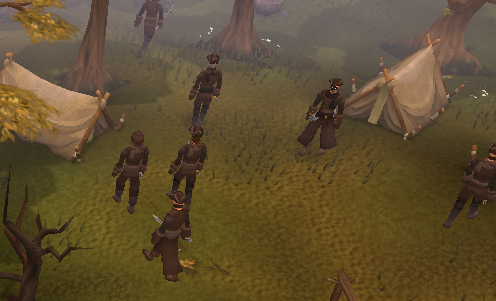 Ask to help get his papers back and he will tell that he heard them talking about their small camp somewhere north west of Varrock. He gives you an empty folder and tells you to retrieve five papers for him. 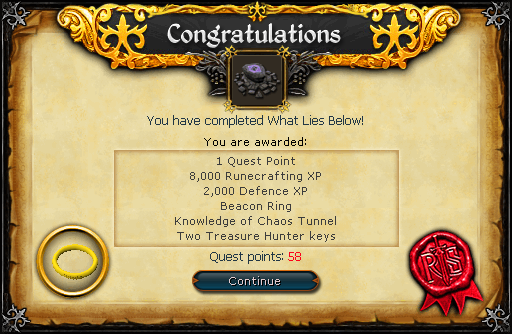 Teleport to the Edgeville lodestone and walk east until you cross the bridge. After crossing the bridge, head south. Behind Lucien's cottage, you should find the outlaws. The camp consists of five tents, and around ten outlaws level 46 with 1150 Life Points each. They each drop a paper piece every time they die so collecting Rat's missing papers shouldn't take too long at all. Just kill five outlaws for the five papers. Use each paper with the folder until it is full, then travel back to Rat. After talking with Rat, he takes the full folder and then asks for help with another job. 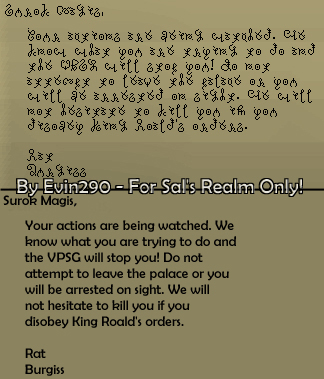 Agree to help with this also and Rat gives you a letter to take to Surok Magis who is in the Varrock Palace's library (the largest room in the north part of the palace's first floor). Talk to Surok who after reading the letter, destroys it. He then asks if you want to hear a secret. He talks about how he has discovered an ancient magic spell that can transform ordinary clay into solid gold! He then asks for a few items to create the gold with, in return for some gold for you to keep. He says that he needs an empty bowl and a wand with which to create the gold with. He also speaks of a shortcut to the chaos altar that avoids going through the wilderness. He then gives you a wand for you to infuse with chaos runes, and a journal that he found. 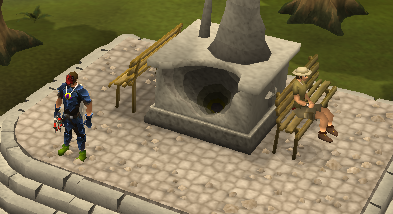 Read the journal and it tells of a Zamorak monk whose group has created a tunnel to the chaos altar under a statue of Saradomin just east of Varrock. Go to the bank if you don't already have 15 chaos runes, the wand Surok gave to you, and a chaos tiara or a chaos talisman. 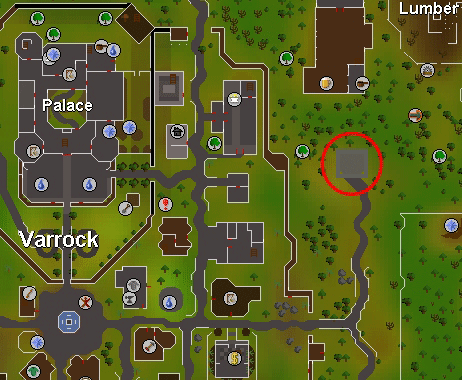 If you want to check out the new way to get to the chaos altar, go out the east entrance of Varrock, and take the path north until you can see a big statue. 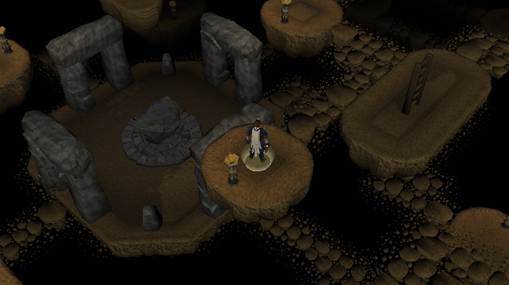 The two other ways are either traveling to Edgeville, then going north and entering the altar in level 7-9 Wilderness, or by entering the Abyss. The Abyss is considered to be faster, but any way will do fine. Talk with Anna Jones who is sitting next to the statue and she will give you a bronze pickaxe. Excavate the statue to mine a hole through it and discover the tunnel. You must have level 42 Mining to mine through the statue and enter the Chaos Tunnels. Follow the main path north, or stop to talk with the three different members of the Dagon'hai to learn a bit more about their group. Enter the portal in the most northern room to be teleported to the third level of the chaos temple. Climb down the ladder that is northwest of where you appear. It is close enough for you to see, but the path will take a while because it wanders around. If you brought the pure essence instead of the chaos runes, now craft them into the runes. Now, you just have to use your wand with the altar to create an infused wand . Then use the portal that is just south east of the altar to come out in level 10 wild right above Edgeville, or just teleport back to Varrock. Go back and talk to Surok with the infused wand and the empty bowl in your inventory. He says his spell will take some time to prepare and asks you to take a letter back to Rat. When Rat receives the letter, he tells you it is bad news and that he is going to let you in on a little secret. He isn't a trader, he is actually a Commander of the Varrock Palace Secret Guard, or VPSG for short. You then learn he has gotten word that Surok discovered a mind-control spell and intends to use it on King Roald for Surok to control. Surok was under guard and couldn't get the items he needed to make the spell, but by tricking you to gather all of them, he is now able to cast the spell. Then you learn one of his contacts might be able to counter the mind-control spell and you need to visit him. The contact turns out to be Zaff, the staff shop keeper in the west part of Varrock Square. Go talk with Zaff who tells you his spell will only work if the king is very weak. His plan is for you to fight the king until almost death, use a beacon ring he gives you to teleport him into the castle, and cast his spell upon the king. He also gives you some instructions which say the same thing in case you forget and don't want to go all the way back to Zaff. This is the part where you fight the king, so if you're level is around 50 or less, you might want to think about bringing some food. He really isn't all that hard, so you don't need much at all. Travel back to the library to arrest Surok, but make sure you are wearing the beacon ring before talking to him. He naturally refuses your arrest and makes this the hard way. After a short cutscene, the king enters the room and your character remarks he looks a bit evil. The king will attack you shortly after the cutscene, so just fight him until his health bar is totally red. He won't die even though it looks like all of his health is gone. Select the option "summon" on the ring by right-clicking it while wearing it. Zaff teleports into the room, shoots a counter spell at the king, effectively curing him and then teleports him out. You and Zaff then turn to face Surok, which cowardly tries to teleport away. He fails to do so, and at that point Zaff says he placed a magic barrier around the room, blocking Surok inside. He tells you they will watch Surok much more carefully in the future and they will keep him there. Now, all you have to do is simply go back and talk to Rat to complete the quest.